Do you intend to transform your bathroom to have spa-like standards? Well, you need to change a few tools inside it, for example, the sink. It is essential that you purchase a sink that complements your style and bathroom decor. The market has a myriad of products worth considering. However, not every item is suitable for you. You should go for a high-quality product that looks fantastic in your space. Do not worry about cost. 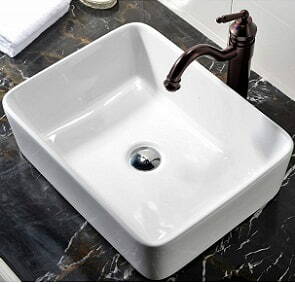 It is possible to find affordable sinks at a reasonable price that suits your budget. If you are unable to settle on a particular sink, this reviews such as the one you are about to read will be of help. The following are the best bathroom sinks you could have in your house. 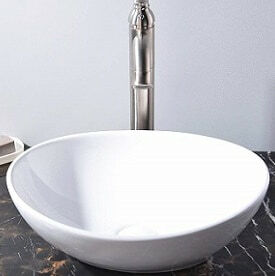 Kingo Home sink boasts of a porcelain ceramic material. Its oval shape and white color look elegant wherever you mount it. It is large enough to ensure water does not splash on your when using it. The drain is at the center of the sink to ensure efficient water flow into the plumbing system. Its size helps with the draining. This product does not come with a pop-up drain or faucet. You should set aside some money for the two accessories. If you love products with simple designs, Kingo offers such. The brand has a shiny, non-porous finish that guarantees durability. The finish is scratch resistant giving the sink a glossy look even after using it for a while. The vessel installation mechanism makes setup of the product easy. 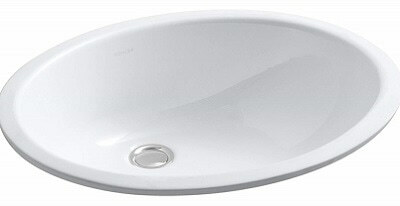 Luxier CS-006 is yet another beautiful bathroom sink that is white in color and made from porcelain ceramic. Unlike Kingo Home brand, this one is square-shaped. The other common feature between the two products is the center location of the drain. However, you will need to buy a tall single-hole faucet for the sink. Moving forward, what does Luxier offer users? For starters, it features a modern design of an art basin. It suits every bathroom considering its sleek appearance. Its oversize creation makes it easy to use. You do not have to worry about water reaching other surfaces in your bathroom. About construction, this item employs high-quality ceramic. It is durable and will give you value for your money. The above-the-counter installation is perfect. You will also have to buy a pop-up drain separately. A Brushed nickel, oil rubbed bronze or chrome drain will augur well with the sink. 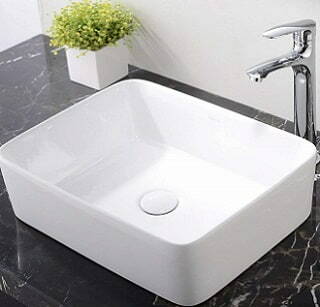 Aquaterior Modern Sink would be an ideal bathroom sink for a spa. It is round and of a shiny, reddish color. The tempered glass material adds to its beauty. With the minimalist design, this product fits in small spaces as well as large. The construction is artistic thus appeals to those who like creativity in products. Like the other models in the review, this brand is for countertop mounting. Note that you will buy a mounting ring, faucet, and drain separately. It is a standard requirement for bathroom sinks. This item is lightweight weighing about 16 pounds. It is top-quality, durable, and well-built. Replacing it will take a while. Do you like decorative items? Well, Enbol will be of value to you. 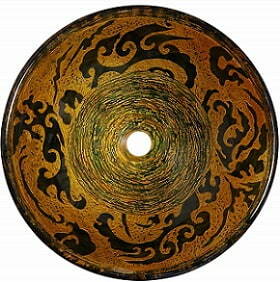 Its interior portrays an innovative design with some flowery pattern on its side and rings at the bottom. It utilizes handcrafted designs. The manufacturer uses a sturdy tempered glass of premium quality. It is stain and scratch-resistant. The glass is smooth to the touch, has an elegant color, and offers your bathroom a classic look. Its surface is non-porous meaning it does not fade or discolor. With a glass thickness of 19 mm, there is no need for concerns about it breaking. It can tolerate high impact and shock; therefore, it is appropriate for daily use. The eye-catching retro style boosts its competitive advantage in the market. Cleaning the sink is easy, and the glossy surface keeps it looking as good as now Enbol can tolerate temperature as high as 350 F. It is a universal product, as it incorporates a standard plumbing connection. 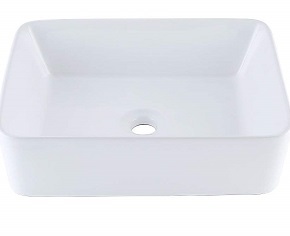 As one of the best bathroom sink, Kes is a rectangular, white, porcelain sink with an irresistible look. It has a big as compared to the other rectangular countertop sinks. The contemporary construction makes it even more appealing. The product lacks faucet holes. You can either use it with a wall or counter faucet. It is high quality and uses a center drain. The product also encompasses ceramic for the extra shine. Like the other brands in the review, you will buy a faucet and drain separately. This beautiful sleek vitreous china is a European inspired modern contemporary design. It is simple to clean and maintain due to its make. Its durability is undoubted because it has been glazed and double fired. This means that it does not break easily and upholds its stain resistance feature. You can wash away dye in it and it will wash off the moment you are done. Moderate in length at 18.9 inches, 14 5-inch widths and a height of 5.1 inches. These are than sold separately with the center hole size that lies at 1-3/4 inches. Once you buy it, this is an above the counter installation. You can choose to customize this by putting pebbles all around it as it has provided the height for you to play with. 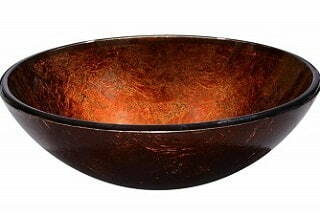 You can go with the choices of either Brushed Nickel, Chrome or Oil Rubbed Bronze Pop up drain. These are another beautiful design of bathroom sinks. 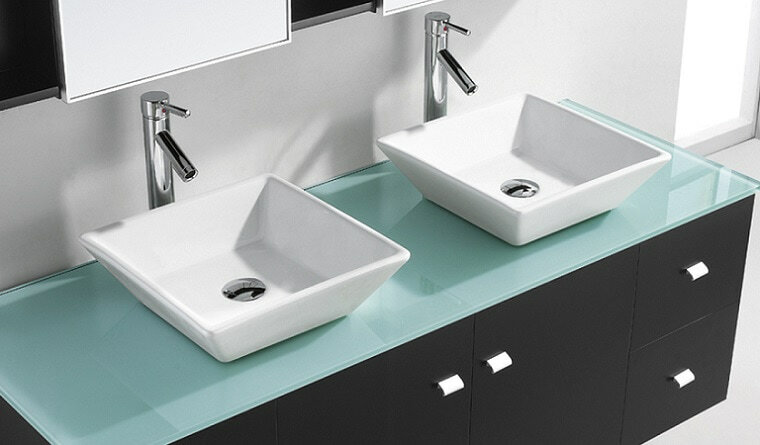 The Caxton bathroom sinks are available in oval or rectangular shapes. Their streamlined designs allow for versatility like mounting them on a wall or tabletop and they still retain their attractive nature. They are available in an extensive collection of color choices that will light up your bathroom in beautiful ways. You can also choose to go for a different pattern and they are also available in various sizes too. They complement both the traditional and modern bathroom designs enabling one to save both time and money in their installation. The standard countertop fit is the simplest and most effective. They have a drain that ensures no liquid overflows. These toilet sinks are made from vitreous china and this actually makes them easy to clean and maintain. Those with an under-mount installation create a sleek transition for a solid surface top. Bring eclectic elegance back to your bathroom with the VCCUCINE Rectangle Above Counter Porcelain Ceramic bathroom sink. It is a European inspired design that is both modern and contemporary. This then makes it very ideal for both home and commercial use. It comes in the color white, made of ceramic and it is mostly installed above the counter. Its measurements are 18.90 inches in length, 14.57 inches width and 5.12 inches in height. With this height, there is little chance of overflow. This beautiful sink is easy to clean with its modern simplicity vitrification, and it is glossy. It is essential to add that it is not easy to scratch and this enables a longer service life. The seamless shape of the sink further adds its aesthetics. It can also resist very high temperatures, so if you need to add water in to inhale, just go right ahead. The square style design is favored for a lot of bathroom sink owners. But none like the design used for this sink. Picture a hexagonal square. With angles corners and a bottom part. Now you have this sink’s design. It is a luxury over-sized creation of sleek European design. It is made of premium ceramic with a glossy glazed finish. With the perfect square measurements of 16 inches by 16 inches, it stands at the height of 45 inches. There are no color variations of this exquisite design since it comes in white. This makes it not only easily cleaned but when well maintained can last for many years. It is further resistant to damage due to the ceramic composition and durability. It is also sold separately with a single hole tall vessel faucet. There are minimal chances that there will be an overflow and it has a pop-up drain stopper. 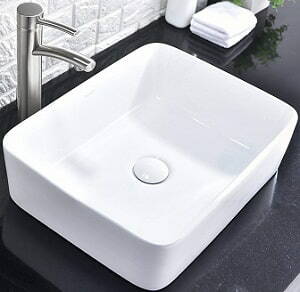 CB-006 luxury ceramic-vessel sink basin by the Decor Star, which is a trusted brand for bathroom-fixtures from 2009 up to date. This is a stylish complement to any bathroom. With a sink like this, you could never regret having installed it. Why? Because above everything else, this is a quiet sink. Most of the European inspired modern contemporary designs use material that makes a sound each time you rinse your toothbrush on its side. But this sink is made of vitreous china and smooth ceramic mixed down to absorb as much sound as it can. It measures 23 inches length by 19 inches wide and stands at 10.2 inches high. 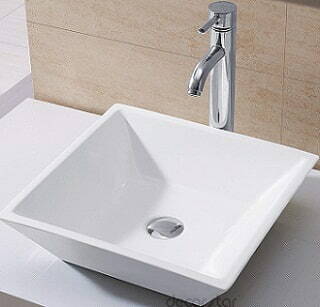 There is no overflow with the Ufaucet Modern-Porcelain Above Counter bathroom sink. It is mounted above the counter and it has a center drain hole that fits 1-3/4 inches. A bathroom sink should not just be about washing hands. It should also be about class and should also tell a lot about you. Designers have come up with personalized bathroom sinks to suit different tastes for different people. Experts have managed to create spaces that even add to the decor by having a plant or a customized accessory. They are produced of quality material and their parts are top of the range. These bathroom sinks are also affordable since they are easily within the price range. With these choices outlined for you, it should be much easier to pick out which one you really like. All of these sinks are inspired by the European style of modern and contemporary designs in order to achieve the maximum beauty and durability targets. 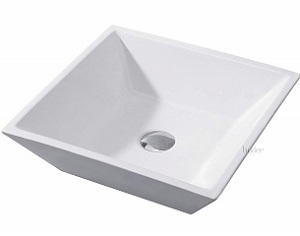 An excellent bathroom sink should be made of easy to clean material like ceramic or porcelain. You can customize both of these materials too and it is an added advantage that they give the finished look of a seamless transition. Any of these sinks can be found online and you can go over more specifications before choosing your last pick. As you go around shopping sinks your home or spa, you cannot afford to buy just any sink. You need something specific. Here are several tips you should know before ordering items online or picking them at the store in your local area. Keep in mind the material of the sink. Do you want glass or porcelain? It depends on your preference. Check the size It should be appropriate for your needs. There are different shapes to choose from including round, square, and rectangular. Always buy durable products made from sturdy materials. Sinks that are easy to install are what you should buy. The design of a bathroom sink is essential. There are simple, artistic, and sophisticated designs. Take your time to find something that best appeals to your taste. We can agree that a sink can make a difference in how your bathroom looks. Perhaps you are constructing a new home, or you are remodeling your bathroom. There is no need of investing money in dull, low-quality items. Your property deserves elegant, modern, durable sinks. It does not matter whether it is a commercial or home sink. The bottom line is you need a product that will suit your decor and liking. This review above offers a guide on some of the best bathroom sinks worth considering. Each of the top 10 products is a good purchase as long as it is what you are looking for. The pointers will help you arrive at a worthwhile product.